Whether your products are meant for industrial use or the everyday consumer, they can be offered for sale in an online store on your website. WaterMag is a new product from FilterMag, an Arizona company selling oil filters for use in machinery used in mining, oil and gas, manufacturing and power generation industries. Their latest product is WaterMag, a molecular water absorber which will get the water out of hydraulic systems. 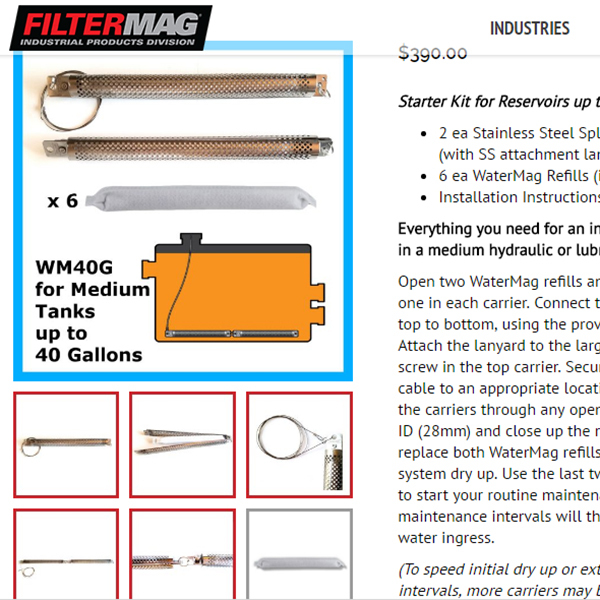 When FilterMag was preparing to launch WaterMag, they asked us to add pages and products to their existing WordPress website. From product photos to product pages, we produced professional results. 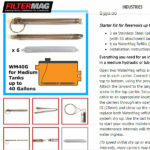 WaterMag filters and carriers can be purchased individually or in kits on the website. The individual product pages provide multiple views of each product and kit so purchasers have a clear view of exactly what they are purchasing. Clicking on any image pops up a box allowing users to click through larger versions of all images. Professional and clear product descriptions provide use information and product specifications. 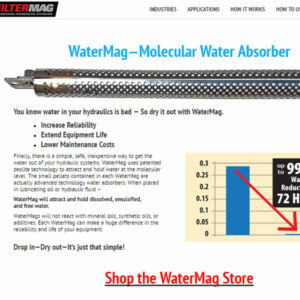 Check out WaterMag and see if you can use it in your vehicle. To explore adding a store or shop to your existing website, contact us!